In the introduction we presented phenomena which are usually treated within different disciplines, so that close links between synergetics and other disciplines could be established at that level. 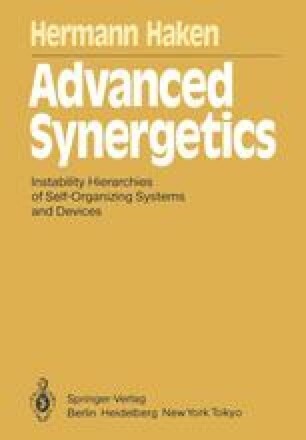 But the present book is primarily devoted to the basic concepts and theoretical methods of synergetics, and therefore in the following the relations between synergetics and other disciplines are discussed at this latter level. Since synergetics has various facets, a scientist approaching it from his own discipline will probably notice those aspects of synergetics first which come closest to the basic ideas of his own field. Based on my discussions with numerous scientists, I shall describe how links can be established in this way. Then I shall try to elucidate the basic differences between synergetics and the other disciplines.